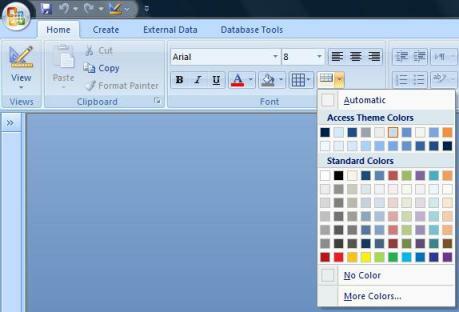 Microsoft Access 2007 introduced many new features to give Access forms enhanced behavior and a modern look that's more Vista-like. 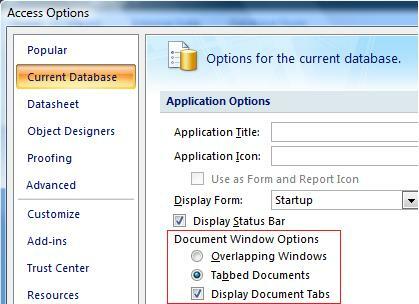 Here are some tips for adding these features to your application. 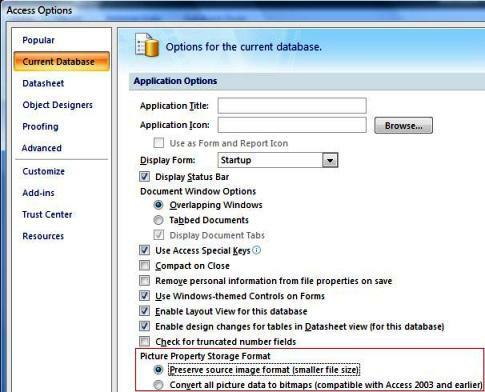 Note that these features also apply to Microsoft Access 2010 and later. NOTE: Some people or applications may prefer the traditional Overlapping Windows which supports placing forms/objects side-by-side. This is not available with Tabbed Documents. To make rows easier to identify, you can specify a different color for every other row. Caution: Do not do this if you need to support users with older versions of Access since the graphics will not appear. This change also impacts the transparency of picture images imported for command buttons. If your command buttons use themes or background colors, having transparent pictures is helpful. By default, white in your imported pictures are transparent if you use the option to "Convert all picture data to bitmaps (compatible with Access 2003 and earlier)". The are not transparent (remain white), if you set the option to Preserve source image format. If you haven't already, make sure the Use Windows-themed Controls on Form option is checked under Access Options, Current Database. This feature was introduced with Access 2003 and gives your command buttons, radio buttons, and other controls a rounded more modern look. If you use the sample databases that come with Access 2007, you'll see the use Calibri and Segoe UI fonts rather than Tahoma and Verdana fonts of before. Use the new fonts to give your forms and reports a fresher look. CAUTION: These fonts come with Office/Access 2007 but may not be installed on user's machines if they are using earlier version of Access. Set this Cursor On Hover property for command buttons so a hand rather than the traditional Windows arrow appears over the command button. Add graphics to Command Buttons with Text. Before you could have graphics or text, but not both. (If you need this feature for pre-Access 2007 deployments, use this feature in our Total Access Components). Command buttons can have transparent borders so they look flat and more like Internet Explorer type buttons. CAUTION: These colors are not backward compatible, so if you use these in Access 2007 and your users are using an older version of Access, these colors will appear Black, so you'll need to programmatically modify these if you're not in Access 2007. Microsoft Access 2007 offers a wide range of new features to help you design applications that are much more visually appealing and functional. Take advantage of the new power to give your Access applications a modern, fresh look of Office/Access 2007 and Vista. For additional information on designing better Access forms, read my paper on Microsoft Access Form Tips and Avoiding Common Mistakes across all versions of Access.